Another outstanding review as always! Well, it looks like I was right and the mysterious figure whom Hulk will be facing in the next issue will be Zeus himself! I also think that our mutual friend Zeno could be right on the money with his suggestion that Banner/Hulk will be tied into the history of the gods and Mother Nature herself Gaia (possibly as her newest child/champion?). Your thoughts would be most appreciated as always! I agree with most of your comments. I don't think though it is that out of character for the Hulk to seek the help of the Gods. Though Bruce is a scientist he is familiar with Gods and magic in his adventures. The story is leading up to something important but it seemed like it was just setting things up for the next issue. Are you going to review Jeff Parker's or Harrison Wilcox's series at all? Zeno, what a coincidence! Expect the Parker/Hardman HULK arc "Scorched Earth" to be reviewed in its entirety very soon, and the same with the Wilcox/Stegman SHE-HULKS series, as both finished Wednesday. I have a LOT to blog about right now so you'll see a ton of new posts arriving in a very short time. Spread the word! Gary, I am wondering if you looked at the previews of Hulk 622. 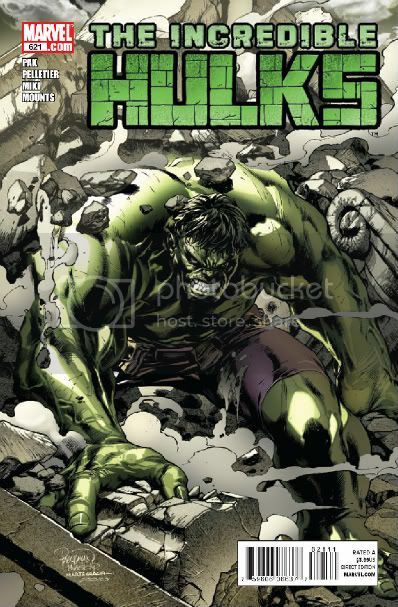 It seems to me that the revelation involving the Hulk's connection to the Greek Gods will be revealed this issue. One page has Zeus reference the 2008 Hulk vs Hercules one shot. That issue hinted at some connection between the Hulk and Gaia. In fact Peter David drew the analogy of the Hulk and Prometheus,the titan who gave fire to the humans. This was merely a metaphor. The actual God Prometheus only appeared in a couple of issues of the Avengers written by Roger Stern in 1987. I have not read these issues yet. He was never seen before or since in Marvel continuity. After reading the story I mentioned in my last post I have learned this will be at least the second time the She Hulk has confronted and fought Zeus. It is interesting that for all the Greek Gods that appeared in the Incredible Hercules and last issue there was no Prometheus. Gaia was not in the 1987 however.